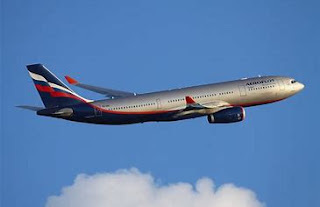 The US airline. 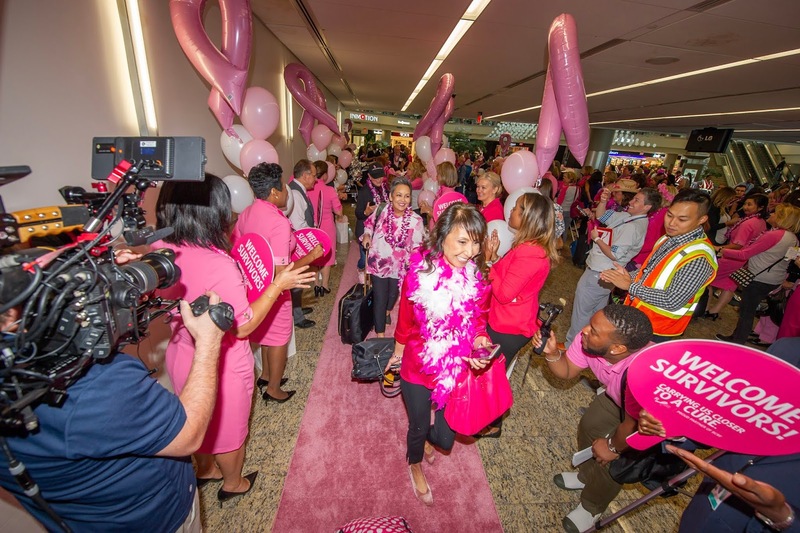 Delta launched its annual "Breast Cancer One" employee survivor flight on Monday, which instigates the carriers month-long campaign to generate awareness and raise money for the Breast Cancer Research Foundation. 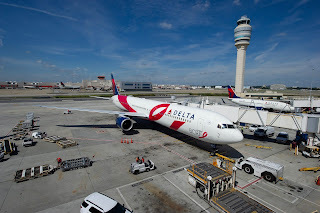 This was the 14th year the Delta survivor flight took to the skies and this carried more than 140 employee breast cancer survivors and nearly 10 customers on board the airline's iconic pink plane from Atlanta to Boston. 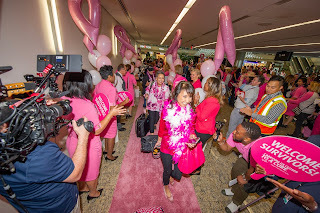 The employee survivors, along with Delta leaders and BCRF executives, were celebrated and honoured during a kickoff celebration at Hartsfield–Jackson Atlanta International Airport and as well as an arrival gatehouse celebration at Logan International Airport and a special evening event in Boston. Since 2005, Delta employees, customers and their friends and families have raised $14.6 million for BCRF, including last year's efforts of $2 million. The collective contributions have funded the vital work of 54 different research projects over the years in the pursuit of eradicating breast cancer. 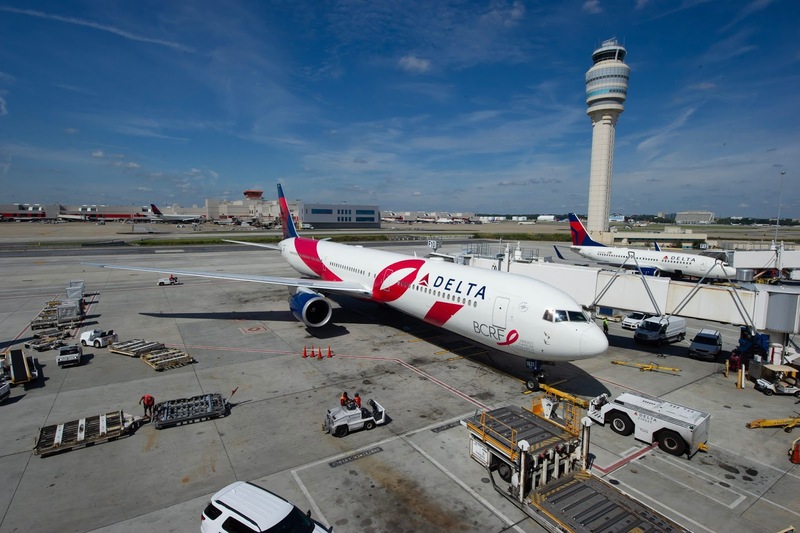 To further raise awareness and support for breast cancer research, Delta employees will wear pink uniforms and sell pink products, including pink lemonade and pink headsets, on board and in Delta Sky Clubs throughout the month of October. For the first time, customers are able to purchase Pink Boutique merchandise through the Pink Boutique online store. Proceeds from the onboard sales and online Pink Boutique will directly benefit BCRF's research projects and its critical mission of finding a cure. Delta is also donating 10 % of all onboard sales directly to BCRF during the month of October for the first time. Customers and employees can also support this year's BCRF fundraising efforts by donating to BCRF onboard flights – and virtually year-round on delta.com and through SkyWish, the charitable arm of Delta's SkyMiles frequent flyer program that allows Delta and its SkyMiles members to donate miles to charitable organizations worldwide. BCRF is a nonprofit organization committed to achieving prevention and a cure for breast cancer. BCRF provides critical funding for cancer research worldwide to fuel advances in tumour biology, genetics, prevention, treatment, metastasis and survivorship. Since its founding in 1993 by Evelyn H. Lauder, BCRF has raised more than half a billion dollars for lifesaving research. In 2017-2018, BCRF will award $59.5 million in annual grants to more than 275 scientists from top universities and medical institutions around the globe.